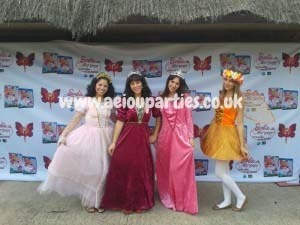 Princess Birthday Parties in London: are you wondering what to do for your girl’s birthday party? How about having one of our entertainers as a fairy tale princess: Elsa, Anna, Snow white, Rapunzel, Cinderella…arriving to your themed party with amazing entertainment, games, glittery face painting, balloon modelling, magic, stories and puppets and filling your children’s faces with a big smile to be remembered forever! Afterwards, a series of games including the classic musical interactions, singing, dancing of their favourite songs from the movies, choreographies and much more. Every prince and princess will be crowned with a glittery face paint design to turn them into beautiful and handsome members of the court in the Far Away Lands! Fantastic puppet shows, with friends they have gathered in their many journeys. 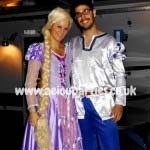 One of the most interesting things we offer together with our Princess Birthday Parties in London is our now famous Pamper Party, where our Princesses will help your princesses become Queens by doing different hairstyles, glittery make-up, and ending up with a fashion/catwalk show where the parents get to be the Paparazzi of these fairy tale characters parading and having fun!! It is no news that every girl is a princess and every boy is a prince, and they love to see how these marvelous characters transform in each story and movie. The possibility of making their dreams come true and bringing right to their homes one of these royal and glamorous beings will surely make a difference between a good party and an amazing one! 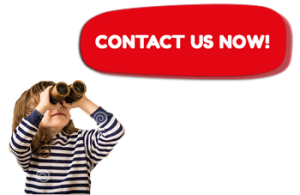 So do not hesitate and give us a call to book one of our Princess Birthday Parties in London as soon as possible! You will be amazed with the smiles upon your children’s faces and you will call us again to come back next year! Have any other ideas for your Princess Birthday Parties in London? Tell us, and we will make the dream come true! !